Was It Inappropriate for Obama to Call His Daughters Beautiful During His Victory Speech? Nah. On Tuesday, in his victory speech, Obama called his daughters beautiful. "Sasha and Malia, before our very eyes, you're growing up to become two strong, smart, beautiful young women, just like your mom," he said. "And I am so proud of you guys." Cue collective "Awwwwwwwwwwwwwwwwwws" from everyone. Well, not everyone: Oxford student Alice Robb took offense to his use of the B-word. Obama's comments beg the question of why a girl's beauty should be source of pride for her father- and why beauty should be a value lauded alongside strength and intelligence. It is disappointing that on Tuesday, Obama- a liberal President seen as a champion for women's rights- conformed to the ideology that sets up beauty as something young girls should aspire to. Women are voted into office with more and more regularity and Obama has appointed women to top Cabinet positions, but girls are still praised not only for their accomplishments but for their appearance. (1) excelling in grace of form, charm of colouring, and other qualities which delight the eye, and call forth admiration, (2) affording keen pleasure to the senses generally, (3) impressing with charm the intellectual or moral sense, through inherent fitness or grace, or exact adaptation to a purpose, and (4) relating to the beautiful; æsthetic. Obama was obviously not just talking about his daughters' physical beauty. Intelligence and strength are unarguably beautiful traits, and in the context of referring to watching your daughters grow up during your emotional victory speech, I don't think it's sexist or "inappropriate" to use the term. Beauty is definitely a tricky word that means different things in different contexts, but it seems rather nitpicky and counterproductive to throw a fit about Obama's adjective choice, given what his win means for women voters. 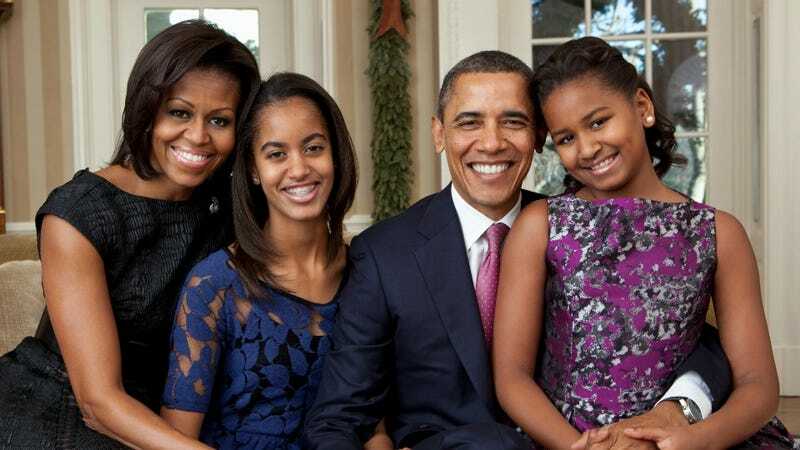 Now that I think about it, the first thing I said to my friends when the Obama family walked out on the stage in Chicago on Tuesday night was, "Wow, what a beautiful family." Sure, all of the Obamas are physically attractive. But that's not at all what I meant, and I don't think that's what Obama meant either.